The term woodworm is a description commonly used to describe the numerous species of wood boring insects common to the United Kingdom, of which there are many. The more frequently found beetles are the common furniture beetle, death watch beetle and the weevil family. In the majority of situations most home owners are not aware that woodworm exist in their property. The first evidence is normally when woodworm are nearing completion of their life cycle. Activity of woodworm can be confirmed by the presence of bore dust, or frass, but it can be difficult to determine whether the infestation is alive or historic and if it needs treating or not? 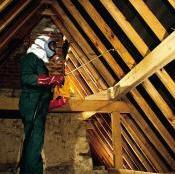 If the woodworm is not active then treatment is not necessary, in fact, it could be illegal. Sadly many of the timber treatment contractors package their findings in a confusing manner which inevitably leads to blanket timber treatments being recommended, whether necessary or not. You can request a survey from us to check the status of the infestation and advise you on whether you need to take any further action. As an independent surveyor we don't treat woodworm ourselves we simply provide impartial advice on any potential infestations. We can help you if you are in the South West which includes London, Bristol, Exeter, Surrey and Reading. A typical timber treatment to an average 3 bedroom property will currently cost in the region of £700, in addition to this are the associated costs of vacating the property and its contents for the duration of the treatment and during recovery. Many timber treatments specified by contractors are simply not necessary which, needlessly, expose homeowners and occupants to harmful insecticides and pesticides. 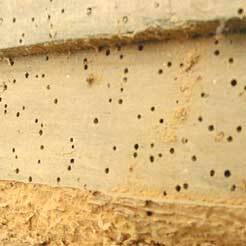 We can help advise you on the best course of action to take if you have, or think you have, woodworm in a property throughout London, Bristol, Exeter, Surrey and Reading. Whilst we cannot always advise that timber treatments are not necessary we can offer the opinion of a professional who has no financial interest in looking for work unlike that of a commission based sales person. Our Surveys and Reports are completely independent. We have no involvement in the treatment process. We only identify whether action needs to be taken and recommend a treatment which someone else would then need to carry out.